Many reviews of the newly released third-generation iPad have described it as an evolutionary update. In these tellings, Apple’s latest tablet mainly improves on what was already good about the previous model by offering a better screen, a better camera, faster cellular data, and faster performance. Many of these reviews come to the conclusion that if you’ve got a working iPad 2, and it’s been serving you well, you don’t need to upgrade—you can wait until the next new iPad. Having used the third-generation iPad for several weeks, I’m here to tell you that, depending on what you use your iPad for, those recommendations may be wrong. 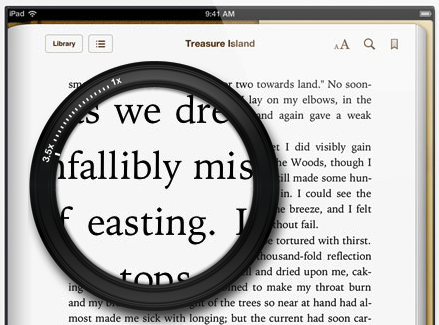 More specifically, if you spend a significant amount of time reading on your iPad, find a way to upgrade. I don’t recall ever making such an unequivocal recommendation about a new version of an Apple product, but with the possible exception of the first iBook with Wi-Fi, I also don’t recall being so impressed by a product’s flagship feature. I actually didn’t expect to be. Before receiving the new iPad on March 16, much of what I heard from people who attended Apple’s iPad unveiling or who had an iPad early for review, was that the new Retina display was everything Apple claimed it to be. But I’d experienced the jump from the iPhone 3GS to the iPhone 4 and its Retina display, so I felt like I already knew how just how much of an improvement I’d see. I was wrong. The first time I saw the new display, I was floored, and after my first session using the new iPad, I was a convert. The new display is simply phenomenal. I expected it to be good, but it’s really good. Really, really good. Text on a screen has never seemed clearer or more…right. Sure, the iPhone 4 and 4S have a higher pixel density, but at the distances most of us use an iPad, you can’t tell the difference. More significant is that the iPhone’s screen is only 3.5 inches (diagonal) across, while the iPad’s screen is 9.7 inches. Using a Retina display nearly as big as a sheet of standard letter paper is a revelation. I still find myself opening text-oriented apps, or zooming in and out of text, just to marvel. Even my friends and family who don’t particularly care about—or, at times, even notice—the differences between SD and HD TV immediately picked up on the display improvements and were suitably impressed. Our lab tests and visual tests agree with Apple’s claim that the new iPad has the best display ever on a mobile device…the new iPad’s picture quality, color accuracy, and gray scale are not only much better than any other tablet or smartphone, [they are] also much better than most HDTVs, laptops, and monitors...with some minor calibration tweaks the new iPad would qualify as a studio reference monitor. But while a better screen obviously means that things such as photos and games look noticeably better, I think text is where you notice the difference the most—every time, all the time. I go a step further: The new iPad is the best device I’ve ever read on. Text and reading are especially important to me, as I spend several hours a day reading on my iPad. I check email and Twitter in the morning; I read RSS feeds over lunch; and I spend two or three hours every night reading RSS feeds, saved Instapaper articles, Twitter, and ebooks. And every time I’ve picked up the new iPad to do that reading, I’ve been stunned by how clear and sharp the text is. Reading is simply easier and more enjoyable when type is better, and on the new iPad, it’s undeniably better (assuming, of course, that your favorite reading apps have been updated for the Retina display). The new iPad has even made me forego my Kindle e-reader. I’ve long been a Kindle fan, because I’ve felt that when it comes to ebook reading, text just looked better and more paper-like with the Kindle’s e-ink technology than on the backlit screen of an iPhone or iPad. But text is so clear on the new iPad that over the past two weeks, every time I would have previously put the iPad down and reached for my Kindle, I’ve kept the iPad in hand. That may change a bit down the road, as I still appreciate the Kindle’s simplicity and light weight, but it will no longer be because I prefer the Kindle’s screen for reading text. So we all agree that the third-generation iPad’s screen is phenomenal. But if you’ve already got an older iPad, is that screen so improved that it’s worth spending $500 or more on a new iPad to get it? Perhaps not, but remember that you can still sell your old iPad for a very good price—as recently as a week ago, Amazon was buying first-generation, 16GB, Wi-Fi iPads for $244, and the corresponding second-generation model for $340. Other vendors are offering a bit less, but still a good amount, and you can also get a good return selling through ebay or Craigslist. If the net result is that you’d be shelling out only $200 or $250 to upgrade, then the expense is easier to justify. After all, if you plan on keeping the new iPad for just a year, you’re talking about only 55 to 68 cents per day for clearer, easier reading—along with all the other benefits the new iPad provides. If you keep the new iPad for two years, that’s only 27 to 34 cents per day. It might not be worth it for you, but for me, with my reading habits, that expense would be easy to justify. Of course, there are plenty of people who don’t want or need a new iPad—the new iPad’s better screen, faster networking, improved camera, and other upgrades just aren’t compelling enough for them. I’m not trying to win them over. But for the people who, like me, use the iPad daily for long reading sessions, I think the new iPad’s screen alone is enough to make you figure out how you’re going to pay for the upgrade.